The cancer-treatment drug Avastin has been linked to 52 cases of flesh-eating disease worldwide, including one that resulted in death in Canada. Health Canada issued a warning today in conjunction with the drug's manufacturer, Hoffmann-La Roche Ltd., echoing an earlier one from the U.S. Food and Drug Administration. It offered no specific details on two Canadian cases. 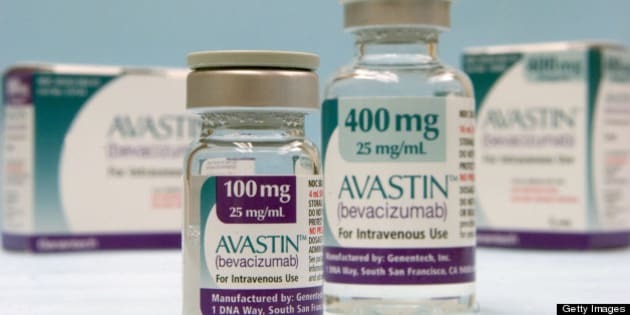 Avastin is used either alone to treat a particular type of brain cancer (glioblastoma), or in combination with chemotherapy to treat cancers that have spread to other parts of the body such as colon, rectal and lung cancer. "Roche has conducted a comprehensive safety review that has identified 52 serious case reports of necrotizing fasciitis that occurred between November 1997 and September 2012, worldwide," the company said in a letter to health-care professionals posted on Health Canada's website. "Two of these reports occurred in Canada. A total of 17 of the global cases reported a fatal outcome, including one Canadian death." The agency said that necrotizing fasciitis is a severe, fast-moving and life-threatening bacterial infection of the skin and soft tissue. It can be brought on by a number of conditions and is the disease that threatened former Quebec premier Lucien Bouchard in the early 1990s. People who have diabetes or cancer have a greater risk of developing necrotizing fasciitis because their immune system responses are lowered. The FDA issued a similar warning in mid-March, indicating that cases have mainly been seen in people who had wound-healing complications, gastrointestinal perforations or fistulas. Health Canada and Roche said about two-thirds of the cases occurred in people treated for colorectal cancer. Of the worldwide cases, 21 had gastrointestinal perforation, fistula formation or wound healing complications before the necrotizing fasciitis developed. All of the patients were receiving other chemotherapies besides Avastin, and some patients did not have any other risk factors. Roche will be working with Health Canada to revise the drug's labelling information. Symptoms can develop rapidly, sometimes within 24 hours of a minor skin injury or surgical wound, Health Canada said. Symptoms include sudden, severe pain in the affected area, fever, redness, heat, swelling or fluid-filled blisters in the skin, scaling, peeling, or discoloured skin over the affected area. "Health Canada recommends that patients who are taking Avastin continue using the drug and to visit their health-care provider if there are any concerns," a spokesperson for the department said. "If necrotizing fasciitis occurs, Avastin administration should be discontinued. Your health-care professional will decide whether Avastin can be re-administered." The warning says that anyone taking Avastin who develops these symptoms or notices other unusual signs or symptoms should contact their health-care professional immediately. Accurate diagnosis and prompt treatment with antibiotics through a vein and surgery are important when treating cases of necrotizing fasciitis, the U.S. Centers for Disease Control and Prevention says.